As a herd species, human beings have an inherent need to live in small groups, herds, and belong to tribes for nurturing, sustenance and protection – but what happens when those basic needs aren’t fulfilled? 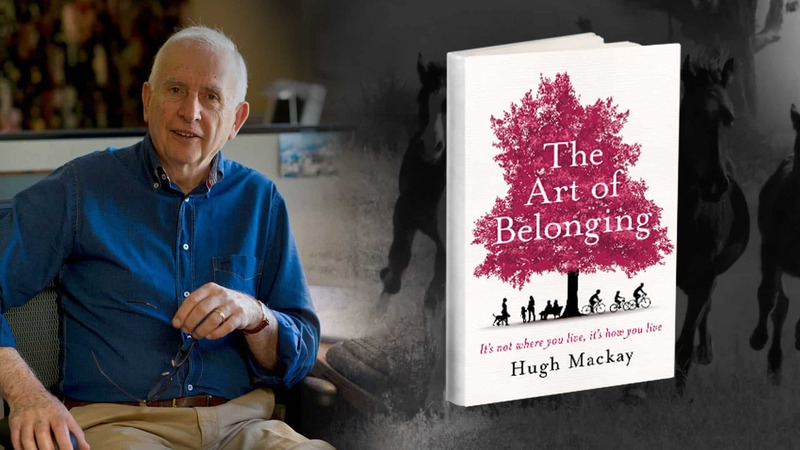 Canberra based Australian social researcher, Hugh Mackay, maintains that our sense of personal identity is heavily impacted, leading to social isolation and fragmentation. In his recent book ‘Australia Reimagined – towards a more compassionate, less anxious society’, the octogenarian whose work has been commissioned by government and corporates for over five decades explains this dynamic. “Like most species on the planet we are social beings, we’re hopeless in isolation, we absolutely depend on social groups and communities to nurture, sustain and protect us. We do need each other. “Because we are social beings the only identity that makes sense is the identity that’s related to where we belong and where we fit into the networks we belong to,” Hugh tells Kerwin Rae writer Meaghan Brown, adding that we simply can’t discover our personal identity in isolation. “Two kinds of networks define us; one is the herd – a group of five to eight people, the other is the tribe, a bigger group, the local community or tribe of professionals. “Our identity does seem to need the intimacy of the herd, and a greater more muscular sense of belonging to something larger as well. This can be a street, suburb or town, but something a bit more than the herd,” he continues. The typical Australian household 120 years ago, was a herd of five to eight people, often three generations under one roof. But from around the 1920’s to today, the nuclear family household, mum dad and the kids, has been the norm. Now, the single person household is the fastest growing household, with the average Australian household being 2.5 people. Hugh says, “I think when we look back at our social history, we’ll probably say the era of the nuclear family household was not particularly healthy. It’s all a bit intense for kids when it’s just them and mum and dad. Particularly when there’s only one or two kids, they’re in the emotional spotlight. There’s nowhere to hide in the nuclear family. He cites contributing factors to social fragmentation are; the sustained relationship breakdown and divorce rates – between 35 to 40 per cent of contemporary marriages – which is very disruptive, and the lower birth rates of 1.7 babies per woman. Additionally, we’re moving house on average, once every six years. It’s typical when families move to a new neighbourhood it’s the kids that get to know each other first, then parents introduce themselves. So with fewer kids around it means there are fewer opportunities for neighbours to mix and have valuable incidental interactions. “We are typically living in domestic situations which are way below the optimal herd size, which means we need to connect with herds beyond the family household. So, friendship circles and colleagues at work are important. The implication is, if we’re not feeling connected to functioning herds and tribes, not feeling part of a functioning family and neighbourhood, friendship circles or the workplace, the effect on our mental health is quite serious. “When people start to feel more anxious, they tend to withdraw even further and become more isolated and self absorbed, rather than reaching out and having contact with a neighbour or helping someone else, which generally speaking is one of the best antidotes for anxiety,” Hugh explains. In contemporary Australia we’re more socially fragmented than ever before and therefore we have an epidemic of anxiety. “With two million Australians suffering from anxiety and two million more suffering from depression you have to consider social factors.This big factor of social fragmentation gives way to a greater risk of social isolation. “Some medical practitioners and psychologists are saying now that social isolation is leading as the next great public health issue. When people feel isolated they tend to cut off from the herd, and a natural part of our biological makeup is that we then tend to feel anxious,” he says. It’s interesting to note here, that despite the recent 26 years of uninterrupted economic growth in Australia, conversely our levels of poverty are growing and we’re living with the highest ever levels of household debt. Hugh says it’s important to acknowledge that you’re part of a tribe. “Neighbourhoods are crucially important, we walk on the same footpath, take our kids to play in the same park, we drink in the same coffee shops and borrow from the same library. These are the people we live amongst, our little neighbourhood is our local tribe. As a Fellow of the Australian Psychological Society with honorary doctorates from Charles Sturt, Macquarie, NSW and Western Sydney Universities, Hugh suggests that personal and social responsibilities are being one and the same. “One of the unfortunate features of western societies like ours at the moment is that we’ve lost our sense of social responsibility to do certain things, like be good neighbours. You hear people say, ‘I don’t know my neighbours. I’ve got my friends, my work colleagues, my family and that’s enough’. “We are diminished as people when we lose sight of the crucial importance of our social responsibility to the neighbourhood and local community and become very selective and only talk to people who are like us. We are not contributing to the health of our society unless we submit ourselves to show respect, compassion and concern for the people we live amongst,” Hugh proffers. The prison structure is a true testament of how important herd and tribes are, as the criminal justice system has devised solitary confinement as the worst punishment we can inflict on a prisoner. “In cases where an individual is rejected by the herd the emotional consequences are catastrophic for most people. If you really want to punish a herd animal, you separate them from the herd. This explains why people living alone is emotionally risky, because social isolation can feel like social exclusion, which can easily morph into feelings of alienation. “In instances where family or friends don’t step up to the responsibilities of those herd relationships by not acknowledging when a herd member is in pain and needs support, the potential emotional damage is serious. There’s a real sadness in that also, when my nearest and dearest are not responsive. It’s doubly hurtful,” he says. Societal and economic factors combine to influence where we live and who with. For example, as gen Y’s face the home purchasing challenge, new trends are emerging, of either staying at home with mum and dad for longer to save, or other options like purchasing in partnership with siblings or friends. This may well ignite a new phase in our social evolution where again the three generation household will become much more common. How we live is something that requires conscious and deliberate decisions that relate to our personal values and integrity. “Although information technology and digital media has made us more connected than ever, at the same time it has made it easier than ever to stay apart from each other. The under 30’s, so again the gen Y’s and millennials, are the heaviest users of social media and tend to be the ones who feel most socially isolated and anxious. This is paradoxical because they’re on devices for hours connected, yet feel isolated because they’re missing out on the crucial thing that herd animals need most, which is face to face social interaction. “So the more time we spend in our online communities and social media networks, the less time we have for actual social interaction. “At the moment the pendulum has swung a bit too high in the direction of using social media as a substitute for face to face and good eye contact which generate feelings of empathy and connection to people. Exchanging text messages or social media posts just don’t have the same emotional force” he explains. Although Hugh believes over time we’ll correct this.